The kit takes the guesswork out of self-diagnosis. CRISPR is moving out of the lab and into your home. Mammoth Biosciences, a new biotech company co-founded by CRISPR pioneer Jennifer Doudna, is developing an at-home CRISPR diagnostics kit. If it reaches the commercial market, this kit could replace “Dr. Google” as the average person’s go-to source for health diagnostics. And given how much the internet makes us freak out about our health (usually for no reason), that really can’t happen soon enough. CRISPR is well known for its gene-editing capabilities, but at its core, it’s really “biology’s search engine,” as Trevor Martin, CEO of Mammoth Biosciences, told The Verge. It’s able to make precise genetic edits because it’s really good at finding the exact spot in a gene that it needs to slice. Mammoth’s at-home kit takes advantage of this natural ability by directing CRISPR to search for very specific sequences linked to particular diseases or traits. At least, it will. The company announced its platform this week, but it’s still looking for partners to create the specialized tests that could work on it. “We are excited to partner with top companies, universities, and institutions in biomarker development who are looking to leverage our CRISPR-based platform to develop and/or commercialize their indications, from cancer and infectious disease to agriculture and industry,” the company’s web site reads. Here’s how the platform will work. The user first places a sample on the kit’s credit-card-sized piece of paper. This sample could be urine, blood, or saliva (which one will likely depend on what is needed for the particular test). Then, a CRISPR protein and its RNA guide search that sample for specific sequences of DNA or RNA. These sequences could be indicative for diseases such as malaria and Zika; a single test could look for multiple diseases. If one of those sequences turns up, the CRISPR system snips it. It also snips what Mammoth calls a “reporter molecule,” which produces a color that’s visible to the naked eye. 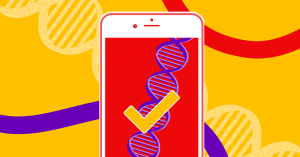 Take a photo of your piece of paper, and the smartphone app will tell you what CRISPR turned up in your sample. More than a third of Americans turn to the internet to diagnose their (sometimes imagined) health problems. This is making us sicker, not healthier. We get stressed out about what we read. We pursue sometimes harmful treatments. We take unnecessary trips to the doctor, exposing ourselves to real illnesses. There’s so much information online, and the average person simply isn’t equipped to assess it all and determine what’s useful and what isn’t. At-home kits can help us address this issue by taking the guesswork out of home diagnosis, and Mammoth’s isn’t the only one in the works. Experts predict the DIY medical testing market will reach $340 million by 2022, and we already have kits focused on everything from cancer to HIV (with varying degrees of accuracy). If Mammoth’s system works as expected, a single, highly accurate kit could eliminate the need for multiple tests. And you’d only have to turn to the internet to order it. While that couldn’t replace your actual doctor, it just might be enough to force “Dr. Google” into retirement.